In 1993, Mr. Jones established Check Into Cash, which made “payday” advances (small, short-term loans) to walk-in customers. The terms were up to two weeks on $200 checks for fees ranging from $15 to $18. The business proved popular with customers and profitable for Mr. Jones, and had grown to more than 700 Check Into Cash stores by late 2002. Currently, the company has some 1250 locations in 31 states. Not only did his idea bloom into a successful venture, but his company has consistently led the way in setting industry standards and best practices for other responsible payday lenders nationwide. In addition to serving as Chairman and CEO of Check Into Cash, Inc., Mr. Jones is also Chairman of Jones Management Services,Inc, which provides management and administrative services to his many different businesses. Another of his ventures, Jones Properties, LLC, owns numerous historic buildings in downtown Cleveland. He was instrumental in helping restore and revitalize the city's downtown business district and beautifying the city’s streets by planting dozens of trees to enhance the area’s environmental health. An avid collegiate wrestling enthusiast, Mr. Jones founded and financed the first Cleveland-Bradley Kids Wrestling Club. His philanthropy includes giving to University of Tennessee athletics, local, state and national high school and college wrestling programs. 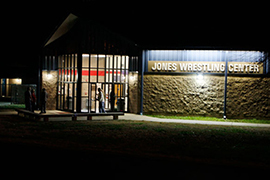 In 2001, he built the Jones Wrestling Center on the campus of his alma mater, Cleveland High School. He named the arena after his Dad, the late Bill Jones. His entrepreneurial spirit continues with several other ventures, including ownership of two restaurants, both of them with cuisine that is outstanding in their own special ways. In 2004, he acquired The Spot, a downtown Cleveland landmark since 1937. Mr. Jones brought back its tradition of homemade burgers and old-fashioned milkshakes. After purchasing a vacant shopping center complex, Mr. Jones built a professional high-tech business campus with an elegant restaurant named after himself, called The Bald Headed Bistro. The upscale restaurant offers a gourmet western dining experience in the heart of the South. In 2014, Allan acquired Hardwick Clothing Company, the oldest tailored clothing maker in the United States.